George Robert Matte, a longtime Hastings resident who served his community, his state and his country in a number of capacities over several decades, died Friday, June 1, 2018 of natural causes. He was 89. Born in Yonkers April 22, 1929, he attended local schools and graduated from Gorton High. He served in the Army in the early 1950s before embarking on a career of more than 35 years with the New York State Police, as a trooper and an investigator. He served in the Bureau of Criminal Investigation and solved several homicides, and was a recipient of the Macy Award for outstanding police work. 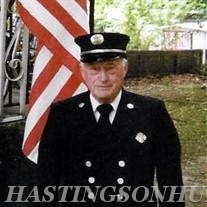 A resident of Hastings since 1960, he served the village as a volunteer firefighter with Hook and Ladder Company 1 for more than 40 years, including time as captain. He also coached Babe Ruth League baseball for many years, was a member of the American Legion and was a longtime parishioner of St. Matthew's Roman Catholic Church. He was predeceased by his wife, Adele (Cazzaniga), three of their children, Robert, George Jr., and an infant son, John, and a brother, Arthur. He is survived by three daughters, Marianne, of Kennebunk, Maine, Judith (Alan) Sanseverino, of Hastings, and Elizabeth (Peter) DiRenzo, of Sleepy Hollow; a son, James (Juliet Pennington), of North Attleboro, Mass. ; daughter-in-law Maureen, of Rochester; and 11 grandchildren, Amanda, Nicole, Tyler, Anthony, Elizabeth, Sarah, Brian, Isabella, Olivia, Alan and Jennifer. Visiting hours are Saturday from 7-9 p.m. and Sunday from 2-5 p.m. at Edwards Dowdle Funeral Home in Dobbs Ferry. A funeral Mass will be celebrated Monday morning at 10 at St. Matthew's Roman Catholic Church in Hastings. In lieu of flowers, the family requests that donations be made to the Hastings Volunteer Fire Department and Ambulance Corps, whose members have been incredibly supportive over the years. Inspector, Capt. Friend. I have fond memories of your stories from the SP. I especially remember all the times bartending at the Hook for you, Jake, and Jim Drumm relaying those stories into the wee hours and realizing (about 3 AM) that I was the only one who had to get up and go to work in the morning. R.I.P Brother.